In determining the appropriate products and models of robotic tooling that are required for an application, it is helpful for all parties to speak the same technical language. For that reason, we have compiled this brief glossary of robotic terms. Collision Sensor - Robotic end effector or device that can detect a crash before or during a collision of the robot or its tool. Collision sensors send a signal back to the robot controller before or during a collision to have the robot avoid the collision or stop before or during a collision. Robotic crash protection devices are collision sensors that detect the collision during the crash. A collision sensor is also know as a robot safety joint, robot overload protection device, crash protection device, quickstop (trademark of Applied Robotics), robot safety mount, robotic clutch, and robotic collision protector. Compensator - Remote Compliance Center Device from ATI using three to twelve elastomeric shear pads to aid in the insertion of peg-in-hole applications. Compensators are used in automated assembly applications to provide compliance for misalignment during assembly. End-Effector - Any object attached to the robot flange (wrist) that serves a function. This would include robotic grippers, robotic tool changers, robotic crash protection, robotic rotary joint, robotic press tooling, compliance device, robotic paint gun, robotic deburring tool, robotic arc welding gun, robotic transgun, etc. End effector is also known as robotic peripheral, robotic accessory, robot or robotic tool, end of arm (EOA) tooling, or end-of-arm device. End effector may also be hyphenated as "end-effector." Manual Tool Changer or Manual Coupler (MC) - An end-effector with two mating parts, a Master-side and a Tool-side, that have been designed to manually lock or couple together, carry a payload, and have the ability to pass utilities such as electrical signals, pneumatic, water, etc. The Manual Tool Changer provides flexibility for any automated process in order to change tools and pass various utilities. The Master-side of the changer mounts to a robot, CNC machine, or other structure. The Tool-side of the changer mounts to tooling, such as grippers, welders, or deburring tools. Remote Compliance Center (RCC) - Any compliance structure has a center-of-compliance. If you were to push at this center, you would generate a pure lateral motion (no rotation). If you were to rotate this center, you would generate a rotation with no lateral motion. A remote compliance center is a compliance center projected outward from the device. Remote compliance centers decouple lateral and angular motion. An RCC device can be used in assembly to ease the insertion force. When a projected compliance center is near the insertion point of a peg-in-hole type assembly, the peg translates into the hole when it strikes the outside lead-in chamfer without rotating. This translation without rotation prevents the jamming and galling seen from compliance devices that have a compliance center far away from the insertion point. The ATI Compensator is an RCC device. 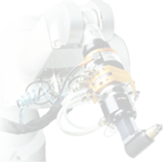 Robot - Any multi-axis automated articulated arm that can be reprogrammed. Robot Crash Protection Device (CPD) - See Collision Sensor. Robotic Deburring Tool - An end-effector designed with integrated compliance to perform deburring, deflashing, edge-breaking or surface finishing operations. Compliance motion compensates for part and fixture variability and maintains consistent force on the work piece. Robotic deburring tools can be mounted to a robot wrist for process-to-part operations. Deburring tools can also be mounted to a bench or fixture for part-to-process operations where the robot articulates the part around the tool. Robotic Deburring Tools may be air- or electrically-driven with various speed options and compliance ranges to accommodate a variety of applications. Robotic Tool Changer or Robot Coupler - An end-effector with two mating parts, a Master-side and a Tool-side that have been designed to lock or couple together automatically, carry a payload, and have the ability to pass utilities such as electrical signals, pneumatic, water, etc. Most robot couplers use pneumatics to lock the Master- and Tool-sides together. The Robot Tool Changer provides the flexibility for any automated process to change tools and pass various utilities. The Master-side of the Tool Changer mounts to a robot, CNC machine, or other structure. The Tool-side of the Tool Changer mounts to tooling, such as grippers, welders, or deburring tools. A Robot Tool Changer is also known as a Quick-Change device (QC), an automatic tool changer (ATC), robot tool changer, robot coupler, robotic coupler, or robotic connector. Tool Stand - A robotic end-effector docking station where, during a tool change-out, the unused tool can be stored. ATI tool stands are divided into 3 product categories: Tool Stand Small (TSS), Tool Stand Medium (TSM) and Tool Stand Large (TSL). Utility Coupler (UC) - A dedicated connection device that couples air or electric signals for docking and fixturing applications. A Utility Coupler is typically not designed to carry payloads. Instead, the ATI Utility Coupler includes compliance features that will compensate for severe tooling misalignments. A Utility Coupler is also known as a multi-coupling or quick connector device. A Utility Coupler can be automatic or manual, locking or non-locking, and it can feature compliance or have no compliance, depending on application requirements. Bearing Race - steel ring in the Tool plate that is engaged by the locking balls during the locking process. Cam - Circular cam attached to the piston that forces the locking balls outward during the locking process. Detection Shaft - Threaded stem inserted into the back side (top) of the Piston, functions as a target to actuate the Lock/Unlock switches. Electrical Module - Any of a wide variety of utility modules that pass electrical power through the Master plate to the Tool plate and to the end-effector. End-Effector - Tool used by the robot to perform a particular function. Interface Plate (IP) - Optional component used to adapt a Tool Changer or Utility Coupler to the user’s robot or tooling. Locking Balls - Hardened steel ball bearings used in the fail-safe locking mechanism. The locking balls are forced outward by the cam against the bearing race to pull the Master and Tool Plates together. Locking Mechanism - Pneumatic or electrical driven device that draws the Master and Tool Plates together securing them in a fail-safe locked condition until the mechanism is unlocked. The locking mechanism consists of locking balls, cam, ball cage, bearing race, and either an pneumatic cylinder or an electric motor. Lock Port - Pneumatic port on the Master plate to which air is supplied to Lock the Master plate to the Tool plate. Master Plate - The half of the Tool Changer that is mounted to a robot. The Master plate contains the locking mechanism. Moment - The applied force multiplied by the distance it is from a point. No-Touch TM - Design feature of all ATI Tool Changer products that allows coupling the Master plate and Tool plate without physical contact prior to locking. Piston - Piston located in the Master plate that actuates the locking mechanism. Pneumatic Module - Any of a wide variety of utility modules that pass pneumatic power through the Master plate to the Tool plate and to the end-effector. Sensor Plate - Cover plate for the back side of the Master plate, seals the pneumatic chamber and provides mounting points for the Lock/Unlock switches. Sensor Interface Plate (SIP) - Used to adapt the Tool Changer Master to the customer-supplied robot. The SIP is essentially a Robot Interface Plate that contains sensors that determine the state (Locked/Unlocked/No Tool) of the Master plate. Tool Plate - The half of the Tool Changer to which various tools or end-effectors are mounted. Tool Stand - Stand that holds Tools not being used by the robot. This is usually supplied by the customer and is specific to the application. Unlock Port - Pneumatic port on the Master plate to which air is supplied to Unlock the Master plate from the Tool plate. Arc Prevention - Is an ATI-exclusive feature that makes it possible to couple/uncouple without switching off electrical module power. Arcing can damage and shorten the life of the electrical power contacts. Arc Prevention extends the life of all electrical power contacts by eliminating arcing caused by inductive loads and high inrush current during coupling/uncoupling. DeviceNet TM - A fieldbus communication network used mostly by devices in industrial settings, that communicates using CAN. DeviceNet is a trademark of ODVA. Discrete - Refers specifically to modules that pass discrete signals and/or power from Master to Tool. The number of discrete pass-through signals is limited by either the number of pins on the connector or the number of pins at the pin block interface between Master and Tool. Some Discrete modules also provide the user the ability to control the Tool Changer by providing “Latch” and “Unlatch” signals to an integrated valve that locks and unlocks the Tool Changer. The Tool Changer Locked, Unlocked, Ready-to-Lock, and TSI switch signals can also be provided to the user, these discrete modules are referred to as Discrete Control/Signal Module. EtherNet/IP TM - EtherNet/IP (Ethernet Industrial Protocol) is a fieldbus communication network, used mostly by devices in industrial settings, that communicates using Ethernet. EtherNet/IP is a trademark of ControlNet International Ltd. used under license by ODVA. Ethernet Switch - An Ethernet network component connecting multiple communication partners with each other. Fieldbus - A generic term referring to any one of a number of industrial computer networking standards. Examples include: CAN, Modbus, and PROFINET. Gigabit Ethernet - A term describing various technologies for transmitting Ethernet frames at a rate of a gigabit per second as defined by the IEEE802.3-2008 standard generally with RJ45, X-coded M12, or A-coded M12 connectors over CAT6 cabling. Typically used in vision applications (GigE Vision). Latch - Command that is issued to lock (couple) the Master and Tool Plates. Lock - The physical action of the coupling the Master and Tool Plates together. Locked - A proximity sensor output signal indicating that the coupling mechanism is in the Locked position. Lock Sensor - A proximity sensor that detects the position of the pneumatically-actuated piston when it is in the locked or missed tool position. Multibus - An advanced computer bus architecture standard used in industrial applications. Multibus I is a IEEE-796 16-bit standard, and Multibus II is a IEEE-1296 32-bit/10MHz bus, at 40Mbyte/s standard. PROFINET - An Ethernet-based fieldbus used in factory automation. RTL - Proximity sensors that detect when the Master and Tool Plates are close enough to each other that it is safe to initiate the a latch command and lock the master and tool together. Teach Plug - device used during the set-up and integration of the robot to override the TSI circuit. Tool-ID - An individual or set of pushbutton switches on the control/signal Tool module that provides a unique identification number for each tool when using multiple tools. The tool-ID also provides the tool not present indication. Tool Present - A hard-connect input (sourced from the Tool) indicating the Master and Tool are electrically connected to each other. Trip Dog - A physical device used to trip a mechanical switch, use in the Tool Stand Interlock circuit. TSI - The Tool Stand Interlock feature is a custom ATI safety solution and circuit designed to only allow Tool Changer release while in the stand or storage location. TSI Relay - A relay circuit present on the ATI Tool module that is driven by a tool stand limit switch in order to close the TSI circuit and allow Tool Changer release. TSIV - output signal supported for monitoring of a tool stand limit switch used with the TSI circuit. TSRV - An output signal provided for health status monitoring of the TSI Relay. Unlatch - The input signal supplied to the ATI Master module to uncouple the Tool Changer. Unlock - The physical action of the uncoupling the Master and Tool Plates. Unlocked - A proximity sensor output signal indicating that the coupling mechanism is in the Unlocked position. Unlock Sensor - A proximity sensor that detects the position of the pneumatically-actuated piston when it is in the unlocked position. Accuracy - See Measurement Uncertainty. ActiveX Component - A reusable software component for the Windows applications. Calibration - The act of measuring a transducer’s raw response to loads and creating data used in converting the response to forces and torques. Calibration Certificate - A statement that says the equipment measures correctly. These statements usually mean the equipment has been tested against national standards. The statements are produced as a result of calibration or recalibration. Calibration Stand - equipment we mount transducers to so we can calibrate them. Compound Loading - Any load that is not purely in one axis. DAQ - Data Acquisition device. DAQ F/T - An F/T Sensor System that uses industry standard data acquisition hardware (usually computer cards) to convert the transducer signals into digital data. DoF - Degrees of Freedom. See Six Degrees of Freedom. Force - Loosely speaking, force is how hard something presses on an object. Like how hard your body presses on a bathroom scale. F/T - Force and Torque. F/T Controller - The electronics that connect to mux transducers. Fxy - The resultant force vector comprised of components Fx and Fy. Full-Scale Error - A measurement of sensing error. For example, if the calibrated measurement range of a sensor is 100 Newtons and the sensor is accurate to within 1 Newton, that sensor will have a Full-Scale Error of 1% (1% = 0.01 = 1 N / 100 N). HTC - Hardware Temperature Compensation. This is a method of improving the temperature performance of transducers. Usually this refers to span temperature compensation. Sometimes it also includes offset temperature compensation. HTC is better than STC. Hysteresis - A source of measurement error caused by the residual effects of previously applied loads. LabVIEW - A graphical programming environment created for data acquisition tasks by National Instruments. Maximum Single-Axis Overload - The largest amount of load in a single axis (all other axes are unloaded) that the transducer can withstand without damage. MAP - Mounting Adapter Plate. The transducer’s MAP attaches to the fixed surface or robot arm. Measurement Uncertainty - The maximum expected error in measurements, as specified on the calibration certificate. Moment - When something receives a torque, we say a moment is applied to it. Mux - Short for multiplexer. F/T Controller Sensor Systems use mux electronics to interface to the transducer signals. Mux Box - A box that holds mux electronics for transducers that are too small for on-board electronics. Net F/T - An F/T Sensor System that connects to the customer’s monitoring equipment via Ethernet or CAN bus or DeviceNet. NI - National Instruments Corporation, the owner of the National Instruments and LabVIEW trademarks. (www.ni.com) Maker of Data Acquisition Cards used by ATI in force sensors. Offset Compensation - Correction of errors that change the zero point of a transducer’s readings. Overload - The condition where more load is applied to the transducer than it can measure. This will result in saturation. Point of Origin - The point on the transducer from which all forces and torques are measured. Quantization - The way the continuously variable transducer signal is converted into discreet digital values. Usually used when describing the change from one digital value to the next. Reaction Torque - Torque applied that does not result in movement. Think of the twisting you attempt to put on a screw or bolt when it does not move. Our transducers sense reaction torque. Recalibration - The periodic verification of measurement equipment, like transducers, calipers and voltmeters, to prove it still measures correctly. The equipment may be adjusted if it doesn't measure correctly. Resolution - The smallest change in load that can be measured. This is usually much smaller than accuracy. Rotary Torque - Torque resulting in something moving. Generally this refers to the torque on things like drive shafts. Our transducers cannot sense rotational torque. Saturation - The condition where the transducer or data acquisition hardware has a load or signal outside of its sensing range. Sensor System - The entire assembly consisting of parts from transducer to data acquisition card. Six-axis Force/Torque Sensor - A device that measures the outputting forces and torques from all three Cartesian coordinates (x, y and z). A six-axis force/torque transducer is also known as a multi-axis force/torque transducer, multi-axis load cell, F/T sensor, or six-axis load cell. Six Degrees of Freedom - A fancy way of saying Fx, Fy, Fz, Tx, Ty and Tz. Span Compensation - Correction of errors that affect the sensitivity (think of the volume control on your radio) of a transducer. STC - Software Temperature Compensation. A method of improving temperature performance of transducers. This method is not as good as HTC. TAP - Tool AdaptorPlate. The TAP part of the transducer is attached to the load that is to be measured. Tool Transformation - Mathematically changing the measurement coordinate system by translating the origin and/or rotating the axes. Torque - The application of a force through a lever or moment arm that causes something to want to turn. For example, you apply torque to a screw to get it to turn. Transducer - The component that converts the sensed load into electrical signals. Txy - The resultant torque vector comprised of components Tx and Ty. Visual Basic - A Microsoft programming environment for developing Windows-based applications. Body - Cylindrical aluminum housing and air pressure chamber. An interface plate to the user’s robot is usually attached here. Cam - A hardened steel ring mounted inside the cover on which the hardened steel ball segments mounted to the stem are nested. Collision - The accidental impact between the end of arm tooling and some obstruction in its path. Cover Plate - Disk-shaped aluminum cover for collision sensor body. Crash - of a disturbance that displaces the Protector™ components from their standard, working position. Interface Plate (IP) - Optional component used to adapt the Protector™ Body or Stem to the user’s robot or tooling. Nano Connector - 8mm electrical connector mounted in a block attached to the side of the body. Piston - The component which, together with the Body, creates a pressure chamber. Varying the pressure in this chamber varies the load required to move the piston. Reset - The ability of the Protector™ to return to its working position when a disturbing force or displacement is removed. Stem - Round tapered post containing tapped holes and a dowel pin hole. An interface plate to the user’s tooling is usually attached here. Switch - A switch that changes state to an open circuit when a crash is detected. Switch Target - A steel block mounted on top of the Piston, the position of which is sensed by the Switch. Bottom Plate - Plate that interfaces customer tooling to compensator. Center-of-Compliance (C-of-C) - The point in space at which a contact force will cause a translation with no rotation and a torque will cause a rotation with no translation. Insertion Contact Point - Point at which the part being inserted contacts its mating part. At this point, a contact force is created. Lock Sensing - Proximity sensor mounted in a sensor fitting detects when compensator is locked. Lock-Up - Pneumatically-powered locking mechanism that locks the compensator rigid for accelerated movements to reduce wear on shear pads. Lock-Up Screw - Locking mechanism component that is pulled into the bottom plate by the lock-up to help securely lock the unit. Overload Pin - Component that limits the amount of compliance to prevent damage to the compensator when overloaded. Sensor Ready - Compensator with a sensor fitting. Customer supplies a proximity sensor for lock sensing. Shear Pad - Component that provides compliance in the lateral, cocking, axial, and torsional directions. Adapter Plate - Device for attaching the deburring tool to either a robot flange or a stationary mounting surface. Air Filter - Device for removing contamination from air supply lines. Typically refers to removal of particulates. Air Lubricator - Device for adding controlled volumes of lubricating oil to the air supplying the air motor. Turbine Motor - Air motor that drives the spindle. Bur - Any unwanted, raised protrusion on the workpiece. Burr - tool used to remove burs from the workpiece. Alternatively referred to as a rotary file, cutter, or bit. Chuck - Gripping device used to hold tools and media to the spindle. Climb Milling - Cutting method where the direction of cutter rotation and tool motion are the same. Coalescing Filter - Device designed to remove liquid aerosols from the supply air lines. Collet - Gripping device used to hold cutting tools in the spindle. Compliance - The ability of the spindle to passively move in response to protrusions on or deviations of the workpiece. Conventional Milling - Method of cutting where the direction of tool motion is opposite that of cutter rotation. Flexdeburr TM - ATI's line of Radially-Compliant (RC) deburring tools. Forward Sensor - The forward sensor is an inductive proximity switch which is ON when the spindle is in the fully forward position indicating there is no contact with the tool. Gearhead - A gearbox responsible for reducing the spindle speed of the air motor. Main Housing - The main cylindrical body of the unit which includes the mounting features. Media - Term referring to tools and/or abrasives held by the tool during the completion of a manufacturing process. Rear Housing - Rear cover to the main housing. This body includes a connection port for the compliance air supply and feed-through seals for optional electrical sensors. Regulator - Device used to set and control the supplied air pressure to lower acceptable levels. Retract Sensor - The retract sensor is an optional inductive proximity switch which is ON when the spindle is in the fully back position indicating there is no further motion possible. Tachometer Sensor - The tachometer sensor is an optional inductive proximity switch which monitors the rotation of a disk mounted behind the chuck on the spindle. The sensor will deliver two OFF pulses per spindle rotation. It is recommended that the tachometer sensor be utilized for process development but removed from the unit when in a production environment. Solenoid Valve - Electrically controlled device for switching air supplies on and off. Spindle - The rotating portion of the deburring tool assembly. Vane Motor - Air motor that drives the tool spindle.